There are multiple ways to go about overcoming your problem(s) with anxiety. You can read self-help books, talk to people who have personally dealt with anxiety, go to support groups, or find a therapist who specializes in treating anxiety disorders. If you live near a larger city, you can find such therapists who specialize in anxiety by doing a google search under the words "anxiety treatment _______," (such as 'Anxiety treatment Boston'). This will bring up names of local therapists— psychiatrists, psychologists, social workers or counselors— who treat anxiety disorders. However you will still need to screen these therapists by phone or in person to find out who might actually be able to help you. Anxiety disorders take some time and work on your part to overcome. If you are looking for help, seek professional guidance. Be careful about web sites offered by unlicensed individuals that promise fast or immediate results. Anxiety is a part of normal human experience. We all know what it is like to feel nervous or tense when faced with a job interview, going out on a first date, giving a public speech, or getting lost in an unfamiliar area. We are all hard-wired to experience anxiety so that we can better cope with situations that are demanding, unfamiliar, or potentially threatening. As such, anxiety is a useful emotion that can improve our performance or protect us from danger. For some people, however, anxiety is excessive. It can occur too often, too intensely, and disrupt, rather than improve, their ability to cope with daily life. If you are one of these people, you may be suffering from an anxiety disorder. Anxiety disorders can cause you to feel crippling anxiety much of the time and/or avoid situations you may have previously handled with ease. Anxiety disorders affect about 17% of adults in the United States between the ages of 18 and 65 (about 40 million people). They are the most common of all mental health problems. In the last twenty years, their incidence has risen due to the increasing stress, complexity and uncertainty of contemporary society. The six major types of anxiety disorders include panic disorder, agoraphobia, social phobia (or social anxiety disorder), specific phobia, obsessive-compulsive disorder, and post-traumatic stress disorder. To see a detailed description of each of these disorders, as well as how each is treated, click on the button for Anxiety Disorders. Anxiety Disorders are highly treatable. With the right help, a majority of people can experience a high degree, if not complete, recovery. Cognitive behavioral therapy (CBT) is the type of therapy commonly used to treat anxiety disorders. It is the only type of therapy that has strong research support for effectiveness with anxiety disorders. All anxiety disorders are established and maintained by avoidance. With CBT you learn to gradually face anxiety-provoking situations, thoughts, or body sensations whose avoidance is the basic cause of your anxiety. Over 10-20 sessions, this "facing what you fear" process occurs in small, doable increments, with much of the work taking place outside of the actual therapy session. This type of therapy also helps you to change your inner dialogue—they way you talk to yourself internally about anxiety. Dr. Bourne's approach to treatment emphasizes cognitive behavioral therapy along with other important considerations such as diet, exercise, personality styles, and the possible need for medication. For further information about treatment with Dr. Bourne, click on the button "basic program." Telephone consultations can be an effective way to get help for your particular issue with anxiety. The cognitive-behavioral processes and techniques used are the same as in face-to-face therapy, however the work is done in hourly phone sessions. For people who suffer from agoraphobia and cannot go far from their homes, phone therapy may be the only therapy option available. Research on phone therapy has found it to be as effective as face-to-face therapy. Since cognitive-behavioral therapy is largely an educational approach, it can be done as effectively by phone as in person. Some advantages of phone therapy include eliminating the commute to a therapist's office, being able to talk in the comfort (and possible safety) of your own home, and providing the therapist an opportunity to listen carefully without distraction from visual cues. For some people phone therapy is the preferred way to work with a therapist; others prefer the reality of face-to-face therapy. Phone Consultations with Dr. Bourne can be arranged by calling 808-334-1847. For details of setting up a phone consultation, click the button "Phone Consultations" at the top of this page. Dr. Edmund Bourne, Ph.D. is a clinical psychologist who has specialized in the treatment of anxiety disorders and related problems for 25 years. For many years he was director of the Anxiety Treatment Center, with offices in San Jose and Santa Rosa, California. He is author of the best-selling Anxiety & Phobia Workbook, which has sold over a million copies worldwide. 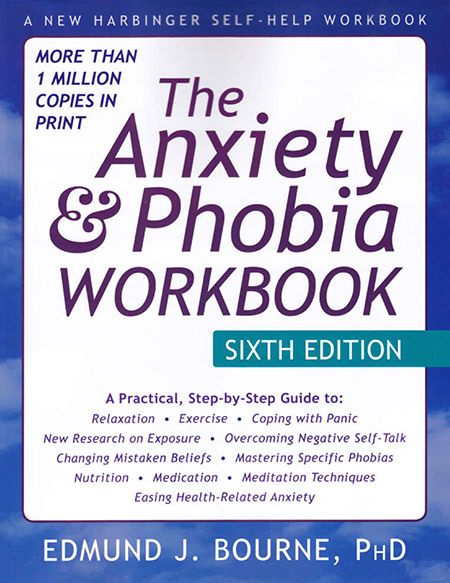 Other books by Dr. Bourne on the topic of anxiety include: Healing Fear, Beyond Anxiety & Phobia, Coping With Anxiety, and Natural Relief for Anxiety. These books have been translated into over a dozen languages and have reached hundreds of thousands of people. Read more about Dr. Bourne by clicking on the button "About Dr. Bourne" at the top left of this page. To see Dr. Bourne's work outside the field of anxiety, click here.